Energetyka is a brand name that is very highly thought of by Polish technicians, engineers and electric engineering scientists. It was founded in 1947 and has been published uninterruptedly ever since. The major part of its technical contents is created by practicians and theoreticians cooperating with the fuel and energy sector, the rest consists of publications of rather a column character with subject matters closely connected with power engineering and ecological aspects of fuel and energy acquisition as well as with generation, transmission and distribution of electric energy. There are also published some selected fragments of the most interesting articles printed in the Polish daily press and periodicals. We publish author's articles talking about our home electric energy market, bring up subjects concerning restructuring of the power industry, show development of the latest energy generation and transmission methods. We present the proven in practice equipment operating and overhaul methods. Our Readers can also find technical and economic deliberations on the green pages of Power Engineering Academy. Energetyka supplies professionals with informations and inspiration that they need to take proper technical and business decisions. Placing ads in Energetyka can help your advertising campaign reach opinion leaders and persons responsible for making decisions in power companies - in other words, all the people necessary to build and promote their trade marks. We offer you efficient publicity and really cheap advertisments. Basing on opinions of our present advertisers we can safely say that we have a very good response to our ads from the side of our clients. Among our readers and subscribers there are not only workers of power engineering companies but we are also read by many professionals and specialists working in various industrial branches, self-government organs and State administrative units as well as in schools and universities. Our readers are also the persons concerned in the present situation of the Polish power industry and changes that take place in it. 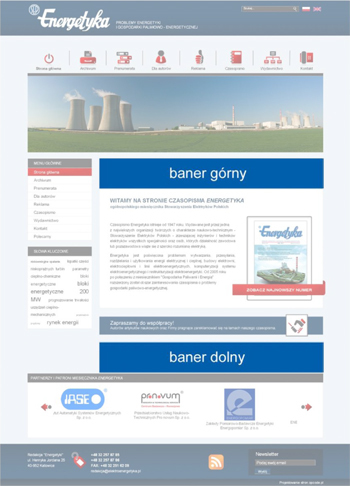 We also offer you a possibility to place advertisments on our Energetyka webpage which popularity is still growing. It is visited by persons interested in subjects connected with power industry and the obtainable informations are highly professional and solid. Website banners are additional excellent and effective forms that the publicity campaign can be supplemented with at a low cost of emission. Offered prices concern only ads ready to print. If there is a need of graphical and technical preparations, cost of the work will be added to basic price. Ready-to-print materials should be submitted to the Editorial Office 5 weeks prior to planned publication. - materials should be delivered on CD/DVD plates or via electronic mail in formats pdf., tif. - Offered prices concern only ads ready to print. If there is a need of graphical and technical preparations, cost of the work will be added to basic price. Ready-to-print materials should be submitted to the Editorial Office 5 weeks prior to planned publication. - materials should be delivered on CD/DVD plates or via electronic mail in formats eps., tif., cdr. - All editorial staff is able to take your advertising order and furnish you with all information needed. Size: 510 x 100 pixels. File format: JPG, PNG, GIF, SWF (flash). Every advertisment can readddress the reader to any other website (the destination address should be delivered together with advertisment materials). If the ad is published repeatedly for a longer period, the advertiser can be granted a discount. 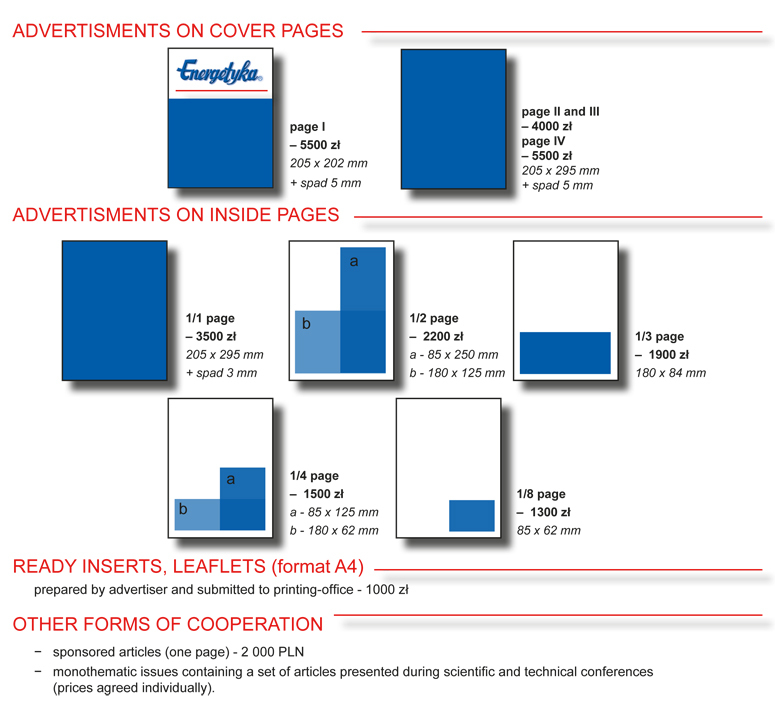 Ads prices do not include the cost of banner preparation (advertiser should submit a ready-to-print banner to be placed on the page).